Keep Calm and Fly Fish: It's Spring Break! One of the perks of working in education is that you get days off. It is officially spring break and the fishing has just gotten better. I have a few places planned to fish so I will be updating as I go. These places are the Yuba Goldfields, Yuba River, Ellis Lake, Horseshoe Lake, and possibly Butte Creek. The fishing will be great with warm sunny days like the ones we've been seeing for the past few weeks. I'm looking forward to it but until then I've been fishing the Feather River for steelhead and Horseshoe Lake for bass and catfish. There have been reports that the spring-run steelhead are in the system and from my own personal experience the days I went out I did see them but I did not catch them. I have been fishing in the morning and my guess is that the fish become more active mid-day when the water is warmer. I swung flies and nymphed but did not get any takes. The steelheading has been pretty tough this year and although the numbers are low the quality of fish is good. I would like to spend more time figuring out what works and what doesn't but my focus this year was to get better at still-water fishing. I will have to put the Feather on hold. I've changed and experimented with new techniques and figured out a system that works pretty well on the lake. It's still tough but my success rate went from zero to one take to about three. Although certain flies work I want to tie flies that have an even better success rate. 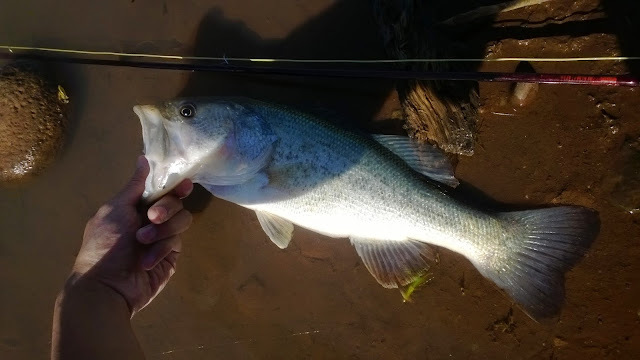 I landed a nice 16'' largemouth and lost another fish that was either a catfish or bass. This pond has some quality fish. I recall in late spring fishing the lake and hooking a fish that literally broke me off it was so strong. I found some carp clooping but they were right literally underneath a tree. Tough casting. They were later spotted clooping in an area I could cast easier but I spooked them after the third cast. Tough fish. My guess is that they were clooping pollen. Looks like I'm going to experiment and tie some flies that look like pollen.